Our dog, Tucker, a German Shepherd mix, goes just about everywhere with my husband and me. We frequent restaurants with outdoor seating so he can join us, and people invariably come up and talk to him, and incidentally us. The employees at the building supply store (where my husband spends a lot of time) know Tucker by name. He’s well known at the bank and pharmacy drive-thrus as well, where they give him dog biscuits. In my book, Petfinder Presents Second Chances: Inspiring Stories of Dog Adoption (a few are still available on Amazon, and royalties go to the Petfinder Foundation), I related the story of Lindsey McClincy of Mukilteo, WA, who knew she would be needing assistance after surgeries. She trained her adopted dog, Nick, to pick things up for her and to open doors. After her third surgery, she was unable to take off her socks, so Nick did it for her. “I just shook my foot and said, ‘Take it.’ He gently nibbled it, and pulled back and back,” she said. Keith Sanderson has trained his dog, Max A Pooch, a Labrador Retriever, to fetch bottles and cans, which Keith then recycles. (Keith adopted Max A Pooch from Orphans of the Storm Animal Shelter in Riverwoods, IL, so he is a recycled dog who recycles.) He has been dubbed the black Lab who has turned green. 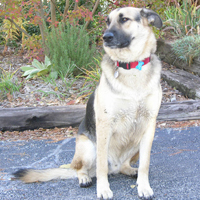 Some dogs alert people about to have seizures; other dogs can detect cancer or assist those with hearing or vision losses. Sometimes the assistance is not so obvious. I remember receiving a happy tail that related how adopting a dog got a lonely person involved with a rescue group where she made new friends. Other stories tell how dogs encourage people to exercise, and a typical happy tail ending is “I didn’t rescue him [or her], he [or she] rescued me.” Another gift is their unconditional love. The fact is they’re our best friends for all reasons.